Does the Barclays Center deserve to be treated pretty much like any other sports facility in the area, in terms of its liquor license, or should there be some curbs resulting from the arena's tight fit into Prospect Heights, just as Wrigley Field in Chicago has a 9:30 pm cutoff and limited night events? A few Brooklynites yesterday argued the latter, during the first phase of a two-part public hearing held by the State Liquor Authority (SLA). 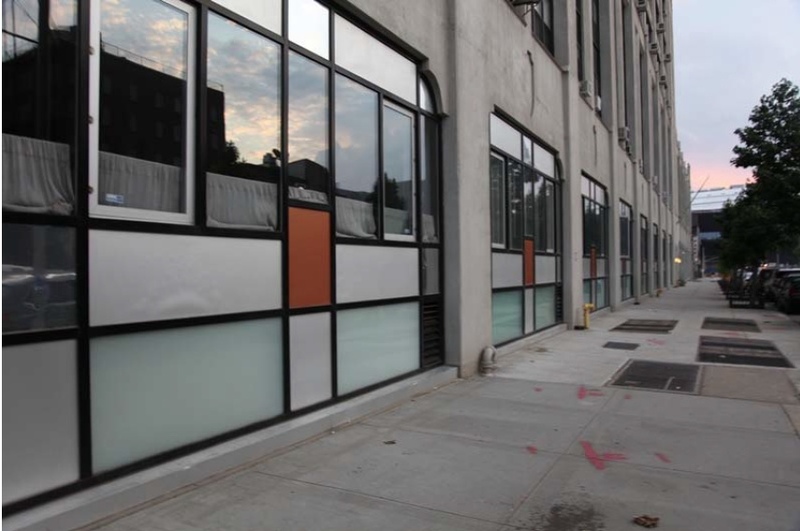 But given that the SLA is directed to weigh input from the local Community Boards, and the latter have already expressed their support for the liquor license, such concerns now have less weight. Administrative law judge Raymond Di Luglio more than once indicated that the venue--if not precisely the license--was "a fait accompli," noting that the SLA's job is not only to respond to neighborly concern but to find out if the liquor license is in the public interest. Actually, in one way, Barclays Center operators seek even more latitude than Madison Square Garden (MSG). The Brooklyn arena plans to keep serving alcohol to VIP patrons for one hour after all events. While MSG offers such latitude for most events, it does not allow after-event liquor sales during NBA games. The NBA cutoff is the end of the third quarter; I'm checking to find out how many arenas allow such after-game sales, in seeming contravention of the cutoff, and whether the Barclays Center needs a waiver from NBA guidelines. Nor may the glaring omission by those seeking the license--the failure to tell the Community Boards that up to 1800 VIP attendees will have access to after-hours alcohol service, after first suggesting alcohol would stop before the end of all events--make a difference when the SLA votes. The number, reported as high as 5,400, was clarified yesterday as 1,800, and arena reps said it was unreasonable to assume that late night service would apply to every arena event, nor would that number take advantage of such service areas at every event. While three people, including a representative of several elected officials, another representing BrooklynSpeaks, and another from the nearby Newswalk condo, visited SLA offices in Harlem to express their opposition, arena operators brought more than 50 letters in favor and in-person support from a representative of Borough President Marty Markowitz. A representative of state Senator Velmanette Montgomery, speaking on behalf of several other elected officials, asked for the opportunity for the two affected Community Boards to revisit the issue of after-hours services--"this is a very serious omission," stated Jim Vogel. But CBs 2 and 6 did not send representatives to modify the assent they expressed before the lawyer for the applicant unveiled the after-hours plan. Nor had the CBs endorsed the 10 pm cutoff requested by groups organized by BrooklynSpeaks and endorsed by Montgomery and others. "The Community Boards have told us at this point, they are glad for our participation in the process," Ashley Cotton, Forest City Ratner's VP for External Affairs, told Di Luglio. "The Community Boards feel like we were sensitive to their concerns, agreed to many of the stipulations, and expressed a willingness to continue to work together," Cotton added. "I believe they have corresponded directly with Michael Jones [of SLA]... that they may potentially want to reopen things, but at this point their position is we were sensitive to their concerns." She cited the creation of a quality of life subcommittee and an upcoming meeting June 26 on issues like sanitation and security, and stressed that the goal would be to ensure that patrons leave with no alcohol and no trash. Vogel, by contrast, said Montgomery's concern is that the "arena is truly unique in its proximity to a residential neighborhood," and later service at the arena could have a domino effect in prompting area bars to stay open later, causing "a tremendous change in the character of the neighborhood." 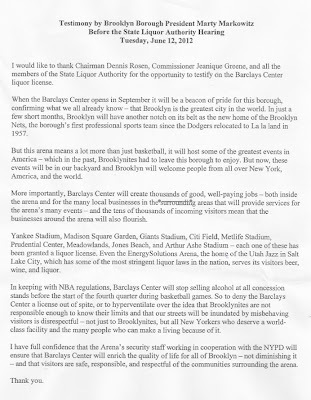 "Brooklyn CB6 has no intention of revisiting its liquor license application review process for the Barclays Center at this time, and stands by its resolution on the matter," District Manager Craig Hammerman told me yesterday. The CB6 executive board met two nights ago, and while I heard that some members were not pleased with the omission, they also acknowledged that they had endorsed their own 2 am cutoff for alcohol sales, albeit under the notion that would be one hour before the end of an event. Barbara Kwon, attorney for Brooklyn Events Center (affiliated with Forest City Ratner), yesterday acknowledged, "The two-tier item's still unresolved, but the Community Boards and my client are in communication on this issue." Regarding CB6, at least, there also might have been the recognition that this is more an issue for the cops. And there may be some politics at work. Half of the community board members are appointed by Markowitz, who famously failed to reappoint some CB6 members who disagreed with him on Atlantic Yards. 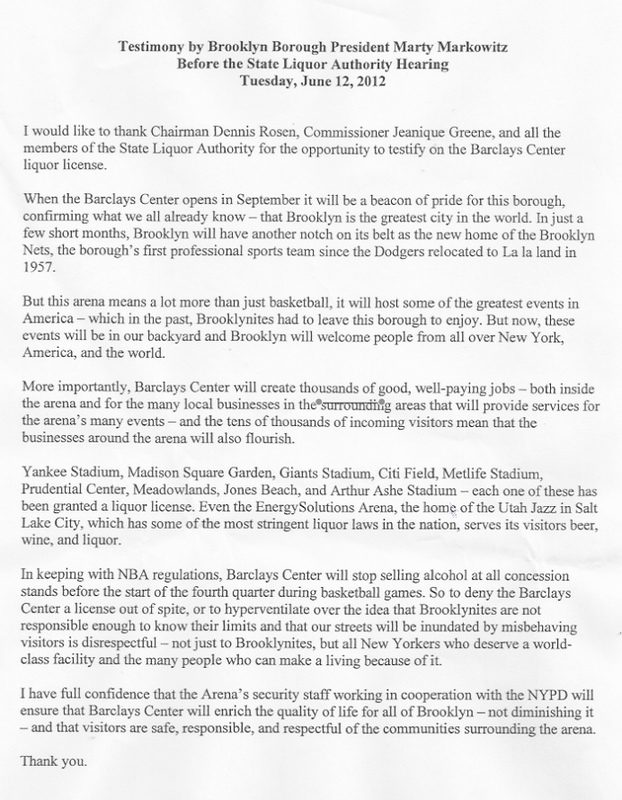 Markowitz sent testimony yesterday arguing that to deny the arena a liquor license "out of spite, or to hyperventilate over the idea that Brooklynites are not responsible enough to know their limits and their our streets will be inundated by misbehaving visitors is disrespectful." Markowitz's submission (click on graphic to enlarge) did not address the issue of after-hours service. However, Luke DePalma, his representative said at the hearing, "We don't share the concerns of the other electeds on the end time." But the arena is very close to some residences, which is why there's a 200-foot cordon around sports facilities under city zoning. Wayne Bailey, the VP and and community outreach board member contact for the 171-unit Newswalk building less than 250 feet from the arena--located in the missing "tooth" of the project site--said the building "has more than serious concerns regarding how and when liquor is served." On Pacific Street, one route from the arena parking lot, some two-thirds of the facade at street level consists of glass windows, walls and doors, with the rest having glass windows some six feet above the sidewalk, Bailey noted. Nearly all of the ground-floor units house families with small children. Given the noise canyon between the building and the Vanderbilt Yard, late-night drinking patrons "will result in over 220 sleepless nights for 100 plus families," he said. And while arena reps suggests that such a total of late events was an exaggeration--after all, there will be day events, as well as ones that don't prompt much drinking--it's worth asking what measures will be taken to protect such areas. After all, as Bailey testified, "alcohol is a major primer for disturbances." Judge Di Luglio, asked if Newswalk had been heard by Community Boards 2 and 6? "They didn't take us into consideration, because they don't represent us," Bailey responded, referencing the curious division of the Atlantic Yards site among three Community Boards. Attorney Kwon pointed out that the applicant invited Community Board 8 to participate in the process, but it declined. Bailey, a member of that Community Board, said he was told it's not in their jurisdiction. Forest City's Cotton said that "many of the issues we're very well aware of and are working to implement measures to make our building as neighborly as possible." When Giovanni Puello of the Fifth Avenue Committee got up to read a statement he was submitting that expressed the position of the BrooklynSpeaks coalition (which includes the Fifth Avenue Committee), the judge urged him to paraphrase the statement. He also asked if the sentiments had been expressed before the community board. Puello said yes, but noted that the applicant's plans did not comply with those publicly stated. He suggested the standard of Wrigley Field. But an SLA official at Tuesday's hearing balked at comparing Brooklyn to the Windy City. "I would take exception to calling us Chicago," said the SLA official, who did not identify herself at the hearing. "I can see comparing us to Yankee Stadium, but Chicago?" Note that the speaker was not the judge but the administrator organizing the hearing, Ms. Williams. Di Luglio again checked to see if anyone was present from the community boards. The continuation of the hearing, expected to draw a larger number of people testifying, likely will be held in a bigger room.